Josh Ogden from Gear-Up in Kansas explained that they've made their long-standing specialist bike storage company something of a one-stop-shop for all kinds of products as long as they're focussed on hiding, tidying and racking bicycles in the home and workshop. Some designs are their own and made in the USA, others are licensed from smaller specialists from all over the world. We admired the Bikes Up and Away units above that hold up to four bikes off the ground for �169.99 and are nicely enough made in oak or aluminium that architects approve of them to turn your bikes into artworks. Cheaper and simpler are the �14.99 free standing Grandstands that you just move around as you need them to support the bike by its rear wheel. Very popular with bike shops apparently as they're tough as old boots and can be adjusted for tyres fat, thin or in-between. Finally, the Steadyrack needs wall mounting but once in place, holds the bike off the ground by its front wheel and then pivots almost flat to one side, opening up possibilities to store multiple bikes in narrow spaces. Gear-Up Steadyrack pivoting bike rack: saves space. �69.99. Gear Up is pleased to welcome Dale's Cycle in Glasgow, Scotland as our newest dealer. 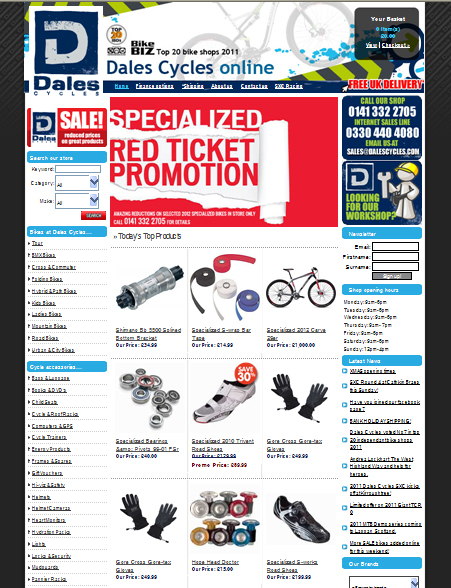 They're launching a brand new site this week - check it out here http://www.dalescycles.com/ and if you're in Glasgow make sure to visit them! Wiki definition: A head badge is a manufacturer's logo affixed to the head tube of a bicycle. For Joseph Ahearne, one of the Pacific Northwest's finest bicycle frame builders, a badge means much more than a logo. An Ahearne custom frame (not to mention custom forks, stems and racks) is a labor of love. The badge tells the story of the bike and its maker. Joseph Ahearne is complicated and intense - a perfectionist working in a profession steeped in historical tradition, yet his designs are inventive and progressive. Each custom frame involves hundreds of choices, some structural, some aesthetic, some personal. Though no two are the same, his hand is evident in every frame he builds. Early in the process, Joseph wrote, "I really like old head tube badges; ones with fancy, regal, squiggly, crest-like designs. Amazing how they once were such an important part of the bike. The designs were so fabulous and ornate, or simple and blocky, but they really tried to show something about the aesthetic sense of the company, the builder, whatever. I want to harken back to that, to some degree. I would like to see some sort of Celtic theme, knots or what-not, and, beside the Ahearne logo it should say somewhere, ?Hand built with love and fury. Portland, Oregon.' The rest is open." Here are some initial sketches to illustrate the "process of process". As a starting point, I presented Joseph with this series of drawings. It was a way to suggest some options and establish directions to pursue or reject. Once we nailed down all the iconic elements, we started working on ways to integrate them with his initial, A for Ahearne, the winged wheel and his motto, ?Hand built with love and fury. Portland, Or'. After nearly two years of a back and forth process, the badge was completed, "With love and fury, in Portland, OR!" Gear Up Inc. is pleased to announce the arrival of the Steadyracktm in our Augusta, KS warehouse. The Steadyrack is a unique storage rack like nothing else we've ever seen and that's why we had to strike up a deal with Steadyrack to be the exclusive distributor in the United States. We've got a great information page set up with videos, content, instructions and a link to purchase the product. We're excited to welcome this great Aussie invention to the Gear Up family of innovative storage solutions and if you'd like to discuss commercial applications, store fixtures, or any other use just give us a call or e-mail us. We want word to spread like a prairie wildfire about the cool new kid on the block - Steadyrack and we're offering discounts for store use and commercial applications as well as offering everyone a savings code for free shipping on any amount of Steadyracks purchased between now and the 4th of July. Simply use FREESTEADYSHIP during checkout to get free ground freight. Greenwala awards points for certain activities. This member has 33835 points. If you live in a small space, you know it can be tricky to store your bike(s). Even if you live in a big place, it's always nice to be organized. I love the household real estate saving quality of this vertical bike rack from Gear Up. This is a floor to ceiling rack that uses tension to hold everything up. There is padding on either end of the main structure to protect floors and ceilings. It's perfect for apartment dwellers, and everyone who would prefer not to put holes in the ceiling and will accommodate 7-11 ft. high ceilings. It has a very small footprint and will keep those bikes up and out of the way while looking great. The body of the rack is heavy duty airplane grade aluminum and works fine indoors or on balconies, carports, garages or basements. If it will be exposed to weather elements, say stored outside on a covered porch, it is recommended that you occasionally apply some WD-40 to the nuts and bolts to extend their life as they are the most vulnerable parts, which the company is happy to replace when and if needed. The arms are carbon steel coated with vinyl--strong but gentle on bikes. The rack is built to last and something you buy once. Set up is pretty straight-forward. On the box it says it takes minutes, and now that I have done it, yes, I can see it taking minutes, but for the first time you might want to allow a good half hour. Should you run into any problems, Gear Up has an extremely helpful and friendly staff that will walk you through it over the phone. 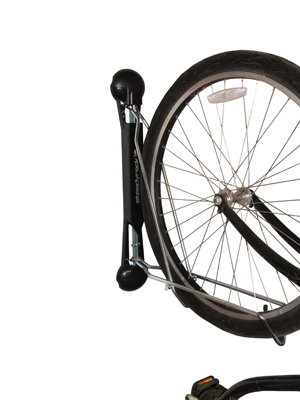 For odd shaped bikes, there are adapters that you can get that will facilitate mounting the bike. I had this issue with my commuter-cruiser hybrid, but with the adapter bar, it fits fine. You can purchase extras arms to mount additional bikes up to 200lbs, though I think aesthetically, two is really ideal unless they are kids' bikes. It is a good looking design that would match many different styles, I think it has an industrial modern look and I can see it in a variety of settings. I really like this for use indoors--there's something fun about seeing your bike in the house. Gear Up has many different styles and storage solutions to choose from, find them HERE. Follow Eco Mama on Twitter. We're not really "cat" people here at Gear Up but our warehouse is surrounded by a large group of feral cats that we throw some food scraps to from time to time. 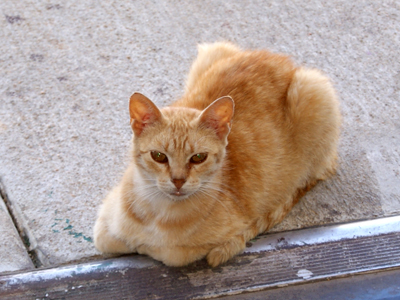 Mama Kitty as we call her now was the boldest of all the cats and began coming in our warehouse when we had the doors open and checking things out. Over time we started feeding her actual cat food and she's kind of adopted us now and we've adopted her. She's still wild as all get out but she likes to guard our door during the daytime and watch the guys in the warehouse pulling orders. It's really sad that the cat colony started with some irresponsible pet owners but that's the case here and all over the country. Like Bob Barker always said "Spay and Neuter your cats". Hopefully she'll get comfortable enough with us that we can pet her at which point she will be going to the Vet so she doesn't support the cycle anymore. There is a universal problem with bicycles - when you aren't riding them they're simply in the way. 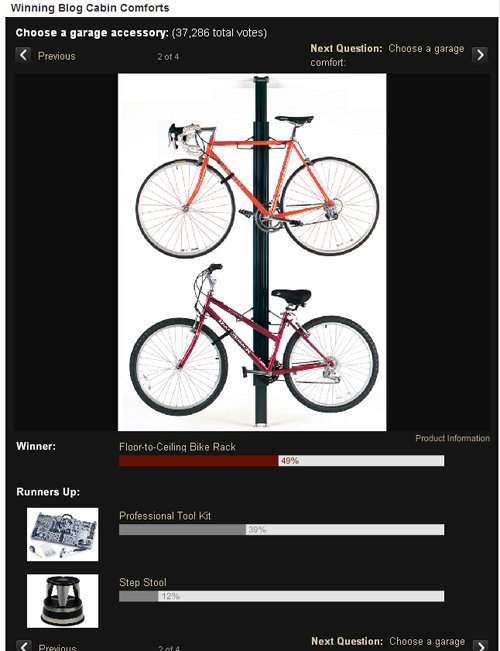 The New York Times recently ran an article on bike storage rooms in New York City apartments. Even if you're not in an apartment, good bike storage is still an issue. If you just lean your bikes (or use the kick-stand - gasp!) in the garage, you'll want to check out a few of these space-saving racks and hooks to get your bikes out of the way. Last year at Interbike we met with David Steadman, who showed off his invention SteadyRack - which made storing bikes after a ride a little easier. Now a year later, Steady Corp has signed an agreement with GearUp, Inc, which brings the rack to the United States. "We are excited to be partnered up with the lads from GearUp and the great distribution network they have and the quality relationship and service level they have established in the U.S.," says Steadman. "The SteadyRack has really taken off here in Australia and we are looking forward to great success in the U.S. as well." The new Steady Rack will once again be on display at Interbike 2011 at the GearUp booth, and hopefully will be in apartments and garages in America soon after. Gear Up BUA Aluminum Floor to Ceiling featured in the DIY Network's Blog Cabin 2010. Thanks to our valued customer Organize.com for submitting the item. Viewers voted overwelmingly for our rack to be included in the barn. Gear Up Sponsored Eliminator Racing qualifies 3 riders to the World Championship! 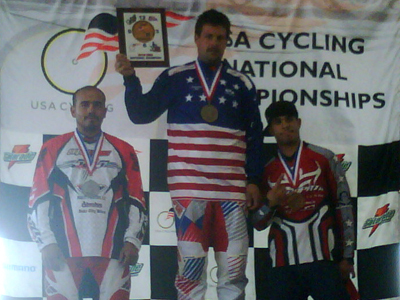 On March 21st in Desoto, Texas USA Cycling held the National Championships. This race was the direct qualifying event for the UCI World Championship to be held in July at Adelaide, Australia. The National championship is the only national title recognized by the international cycling union (UCI). Eliminator riders Jeremy Rommel placed 7th in the Jr Elite category, Nathan Mellone placed 5th in the 29-29 Men and Cody Wilson was crowned the national champion. Eliminator Racing will send 2 riders to the World Championships to compete for the world titles in the riders respective categories.